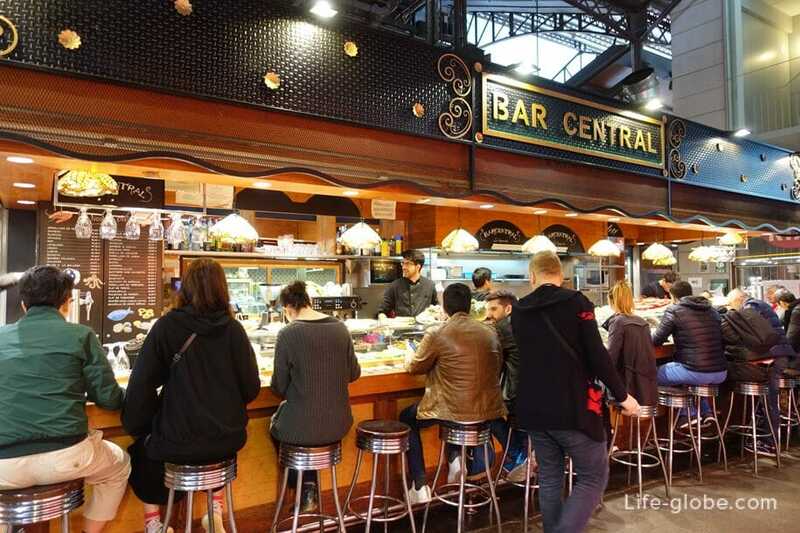 The Boqueria market (Mercat de la Boqueria) in Barcelona, also known as Sant Josep, Mercat de Sant Josep de la Boqueria is a large public market with a very convenient location. 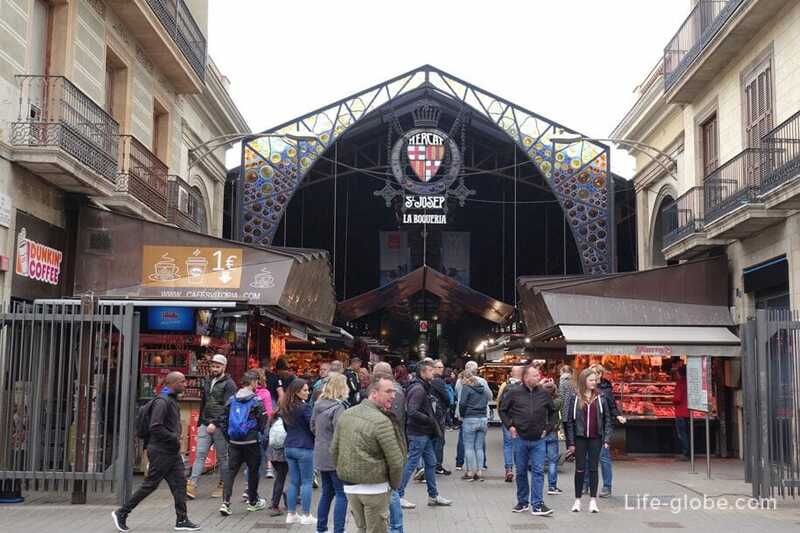 There is a market in the historic centre of Barcelona, the main entrance overlooks the famous tourist street La Rambla. 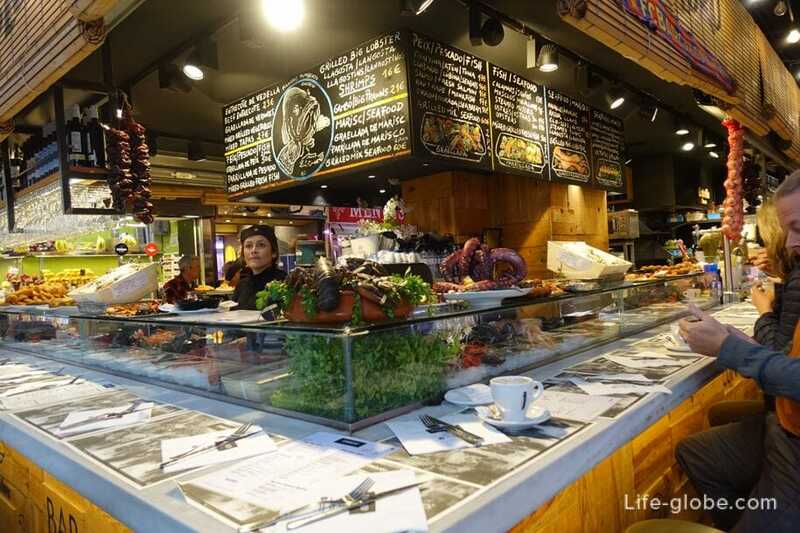 Market address: La Rambla, 91, 08001 Barcelona, Spain. 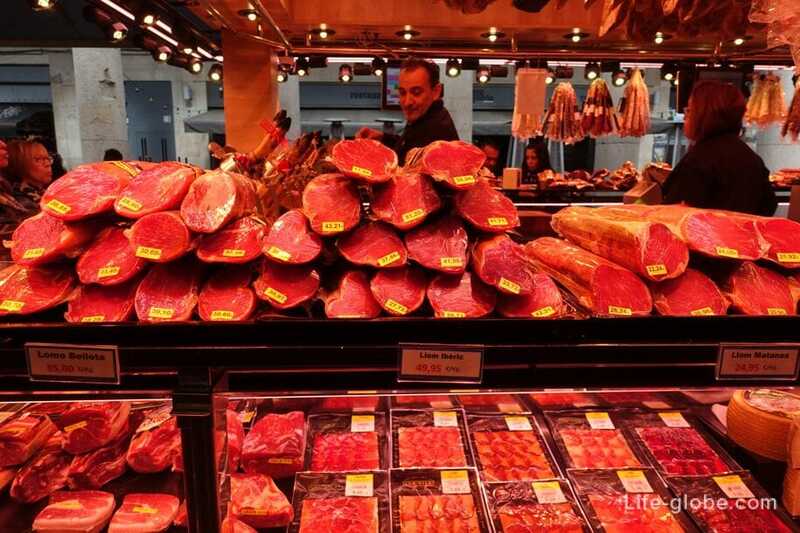 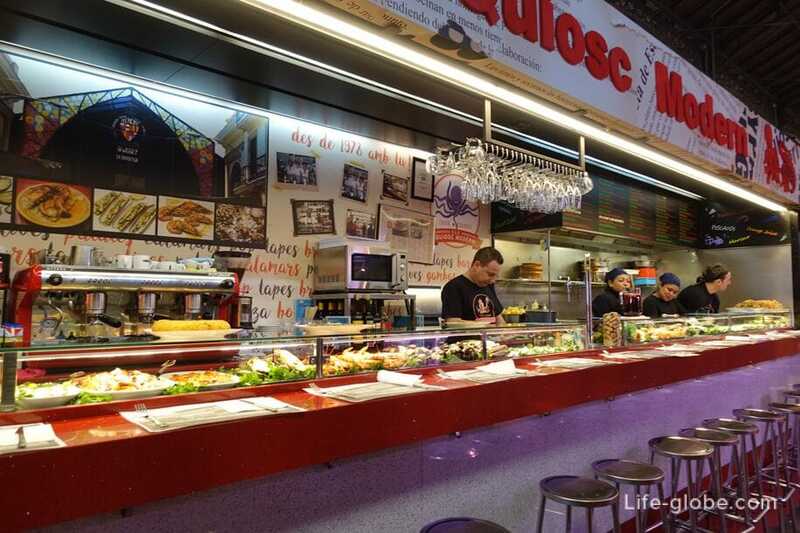 The Boqueria market is quite large, has an area of over 2,500 m2 and is fully made of glass and steel. 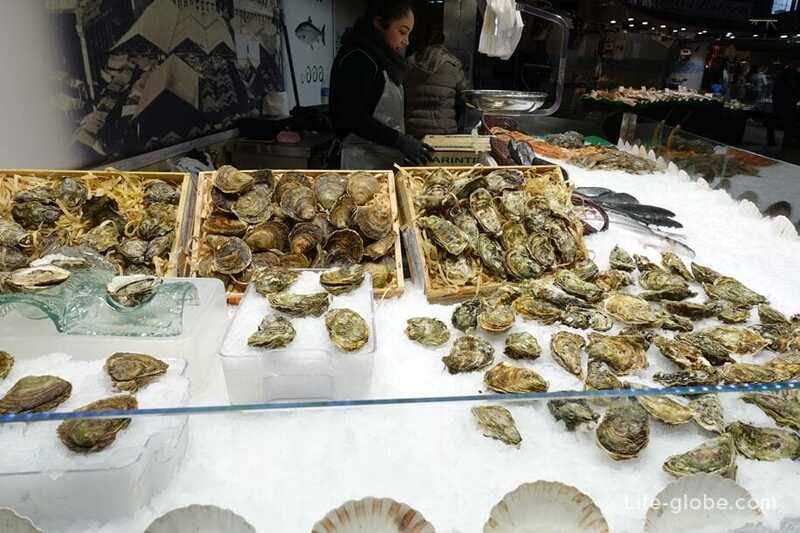 In addition, the market is also very old. 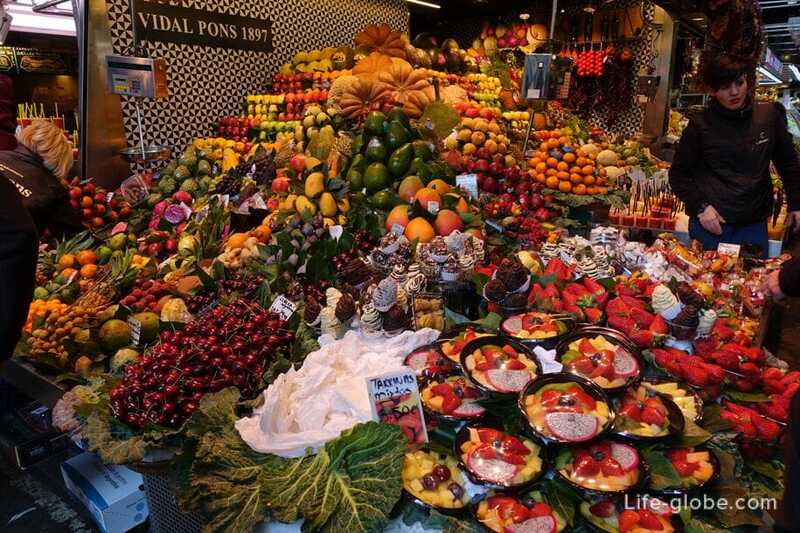 The first mention of the Boqueria market in Barcelona dates from the 1 217. 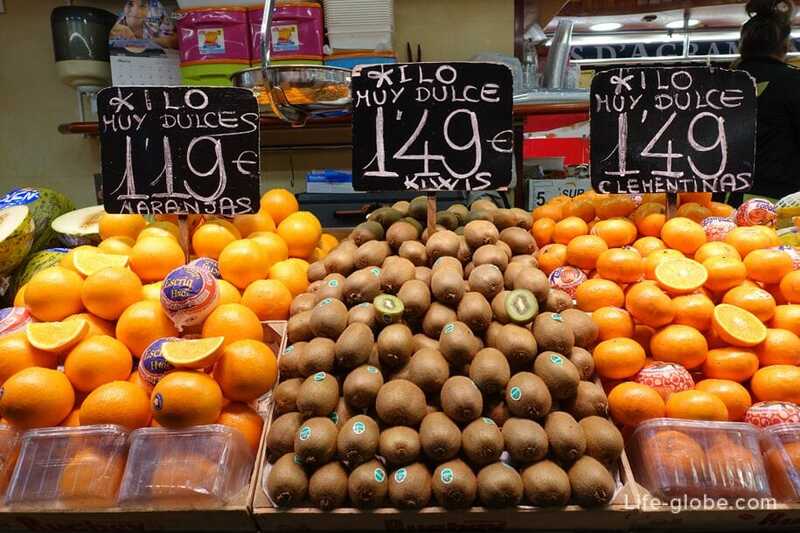 In that time the market was called Merkad Bornet. 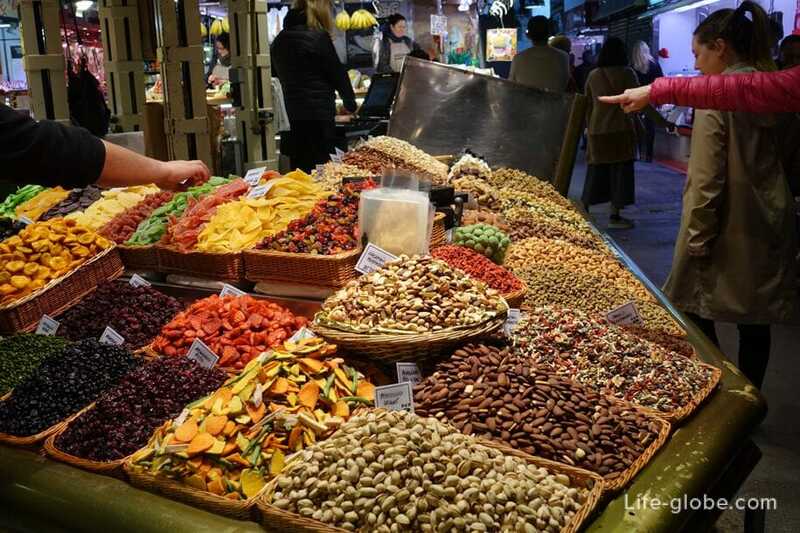 Later, until 1794, it was known simply as Mercat de La Palla, or straw market. 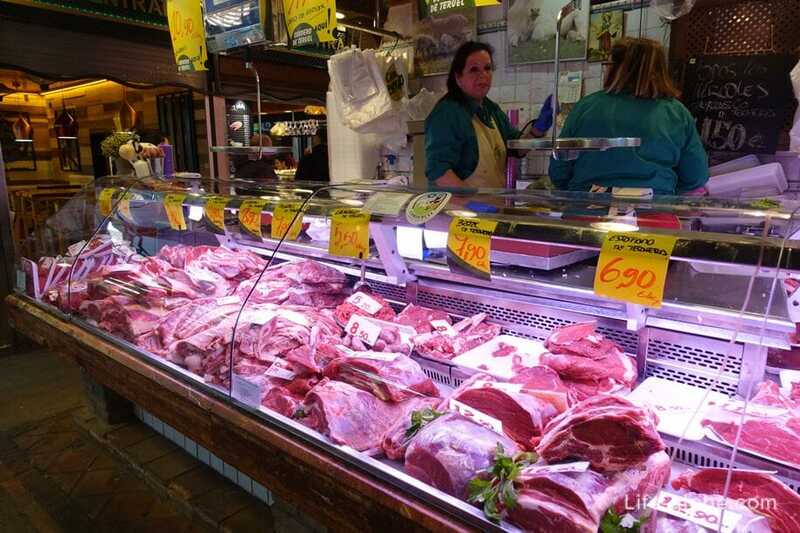 Current name believed to be derived from Catalan boc, which means "goat", because the market sell goat meat and milk. 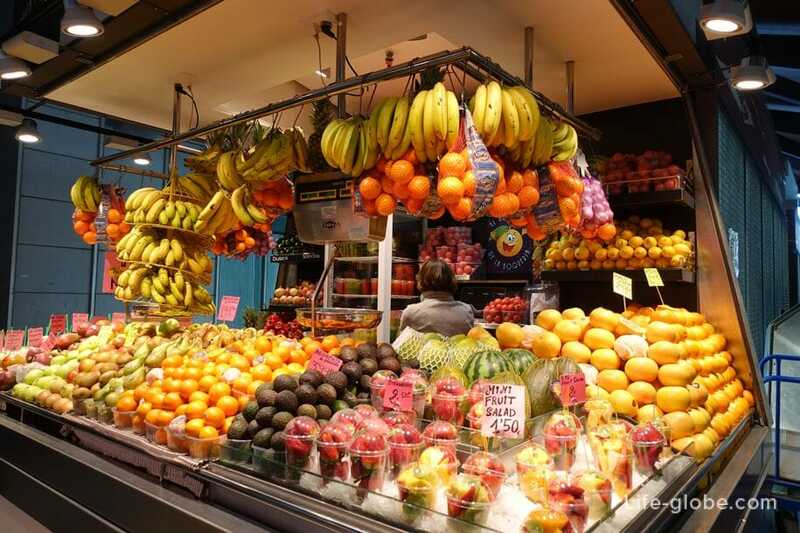 In 1853, the market has become official. 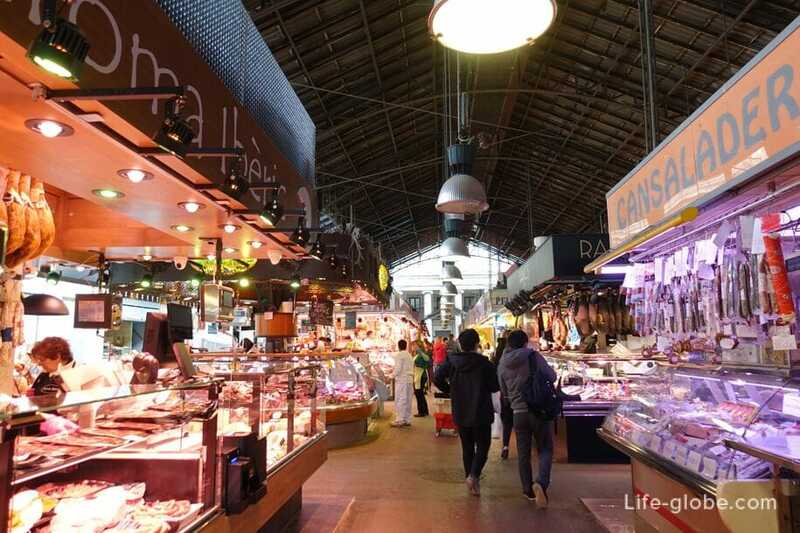 In 1911 he opened a new fish market, and in 1914 was made a metal roof, as well as today. 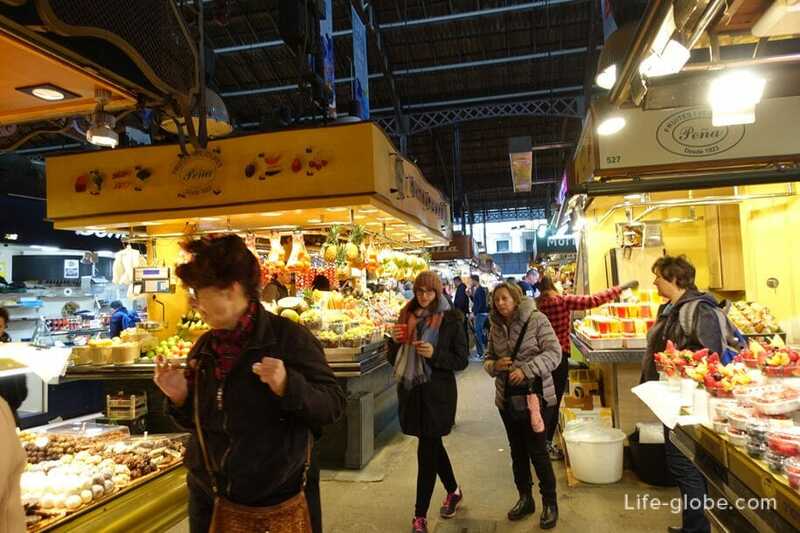 The familiar, even from the photos, the main entrance to the market was designed by architect Antoni de Falguera I Sivilla. 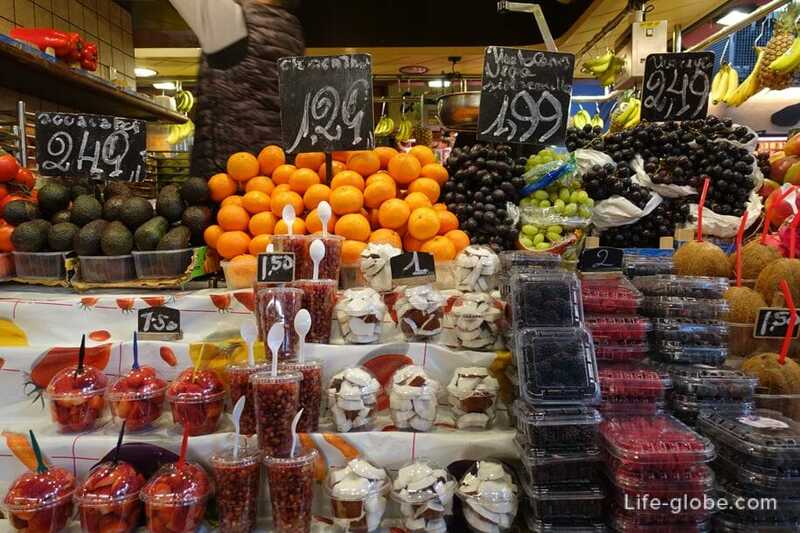 Currently Boqueria is a gastronomic Paradise! 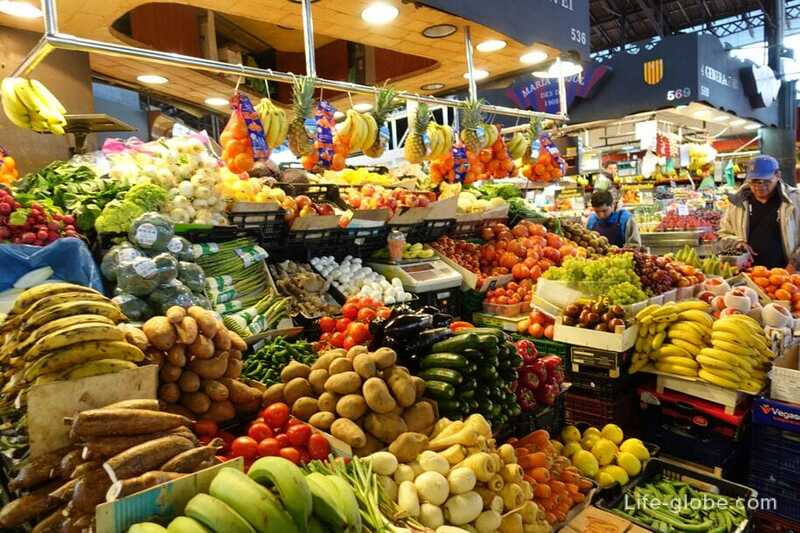 That just is not there, starting from the most famous vegetables and fresh Cape, to the overseas delicacies and tropical fruits, freshly baked bread and chocolate, to oysters, which will open right here will provide you with a slice of lemon and all... you can just go straight into the mouth. 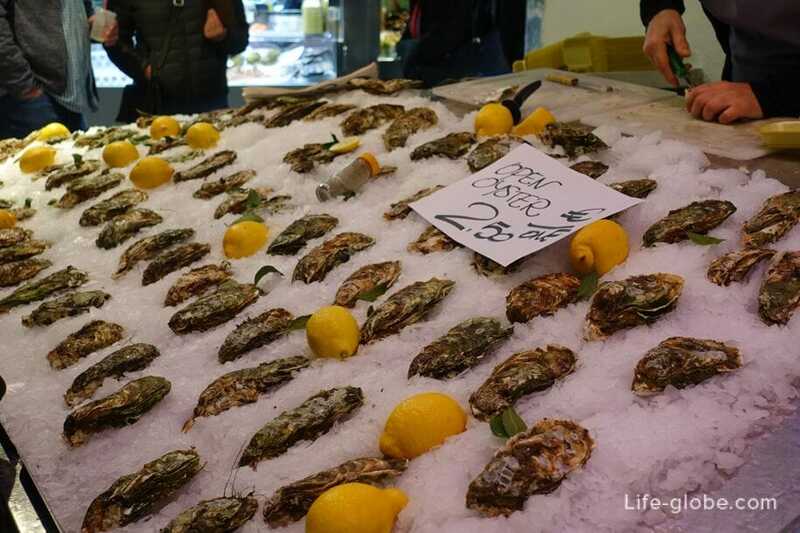 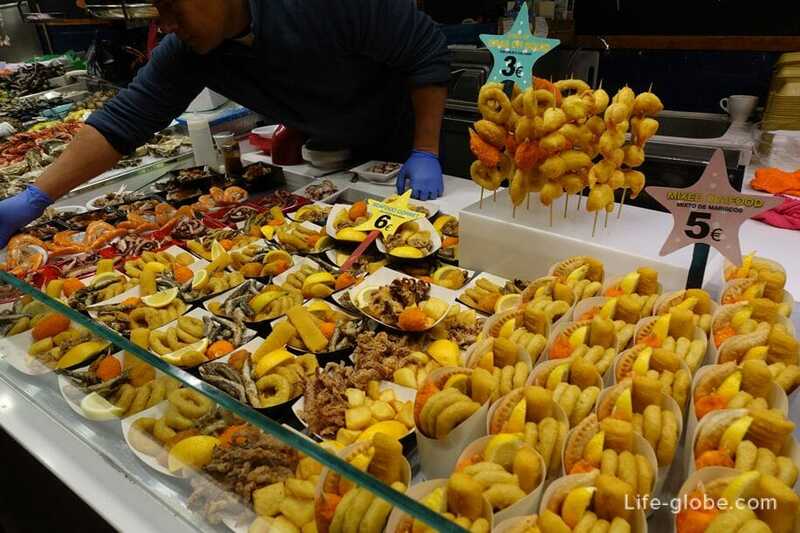 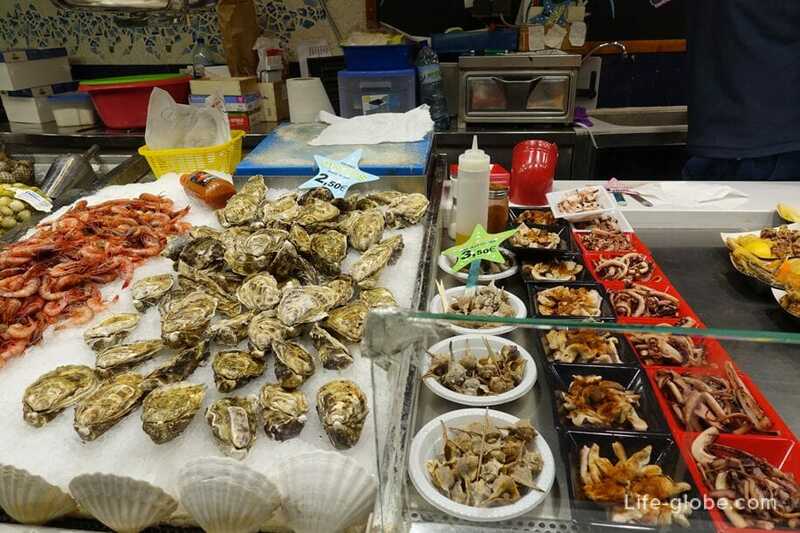 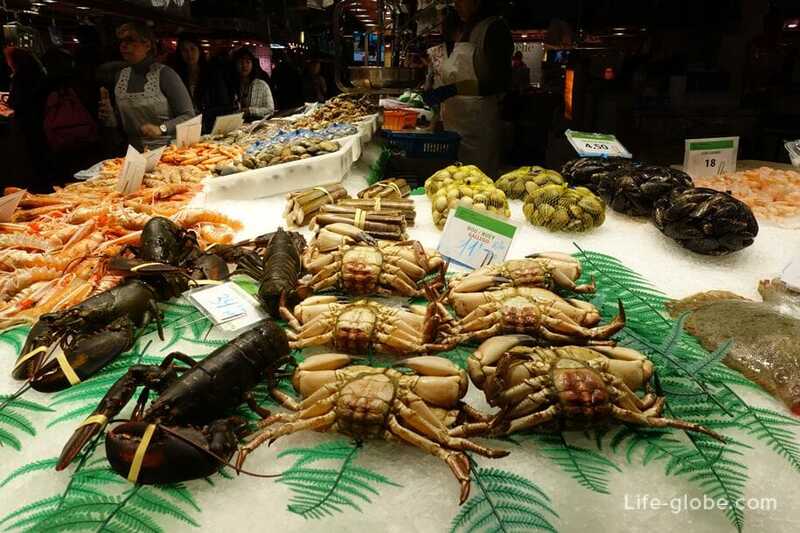 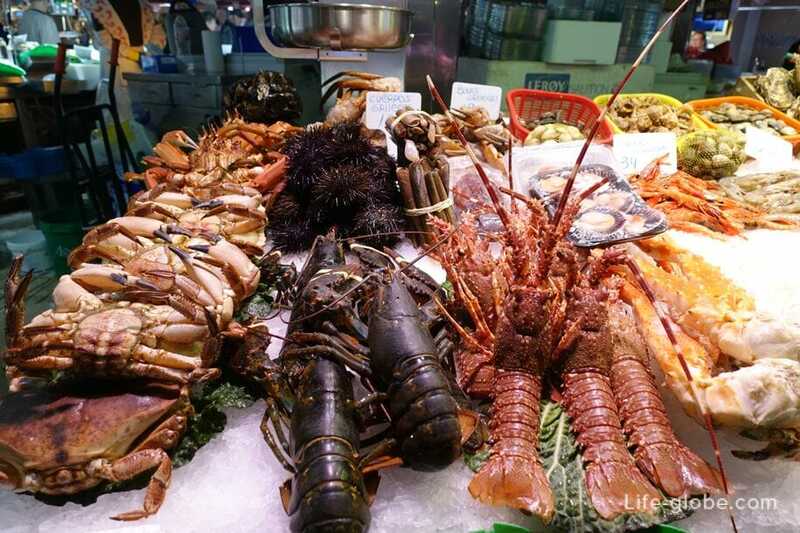 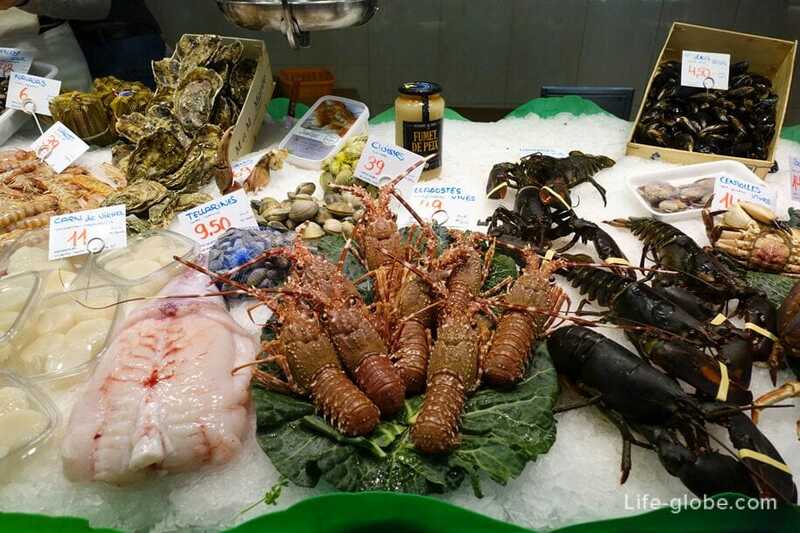 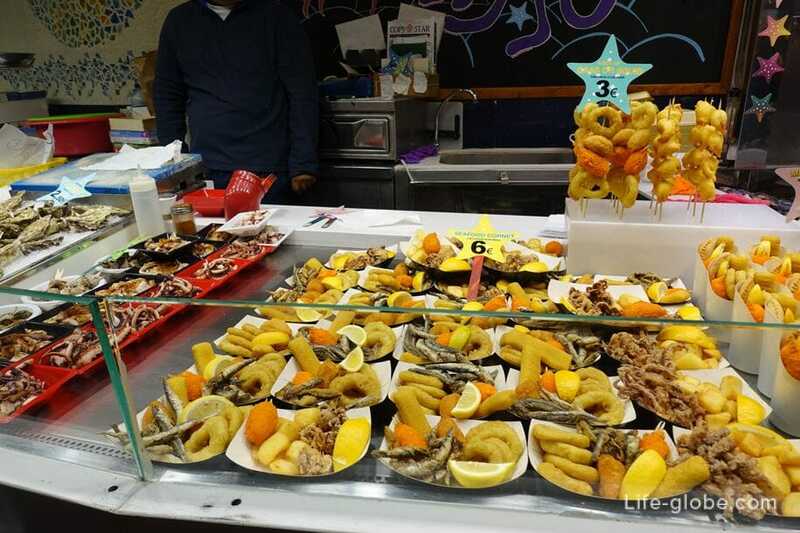 But the choice of seafood and fish, the market simply dazzled. 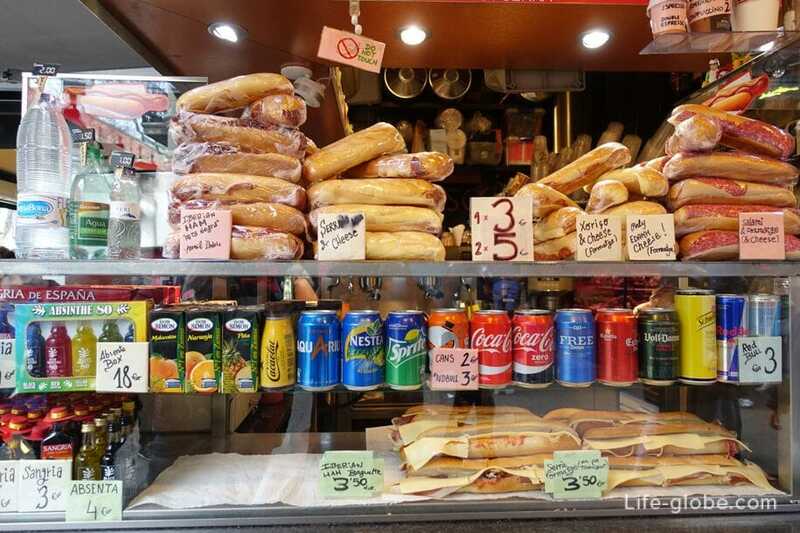 It should be noted, of wounds this tourist, so the prices are appropriate. 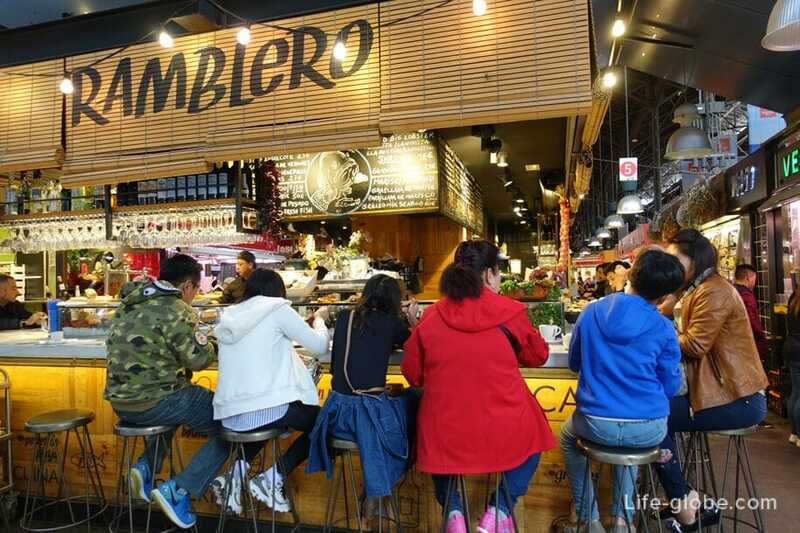 Many tourists come to the market only to watch but to take some photos of gastronomic wonders)). 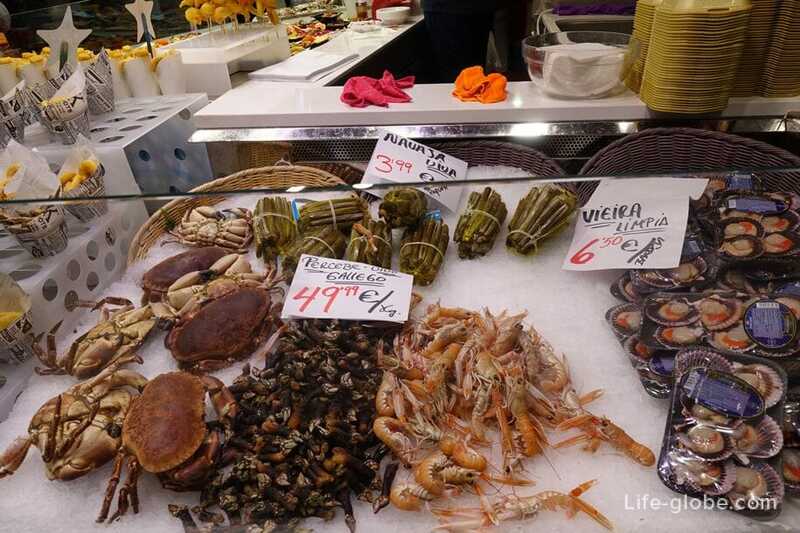 The market prices vary so that sometimes the difference is very noticeable. 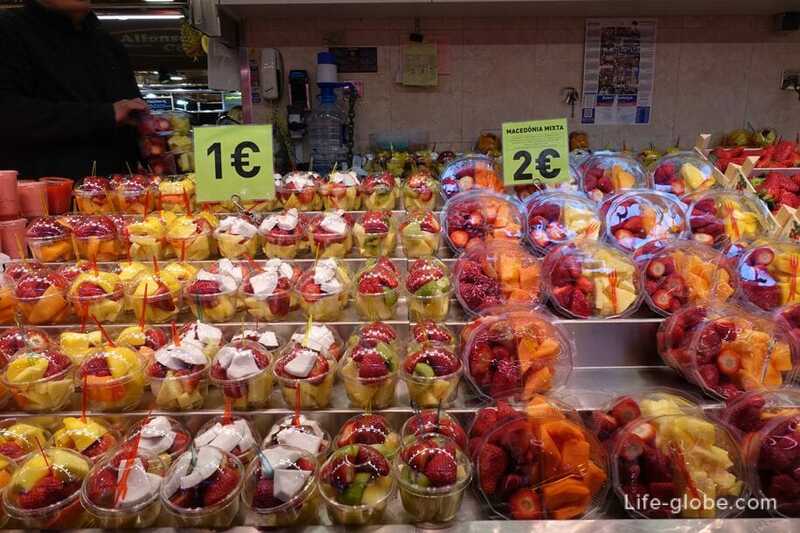 The most expensive products at the entrance and at the beginning of the market, then you can find cheaper. 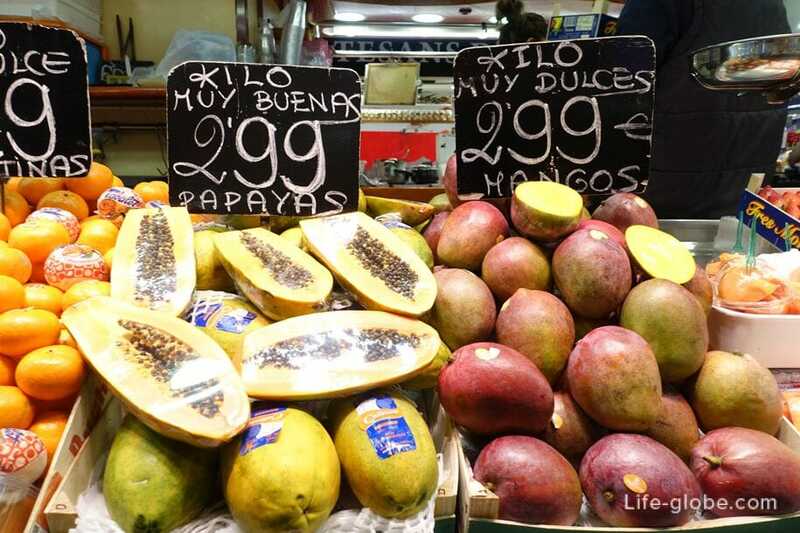 For example, mango is 6 euros a kilo, and there are 3. 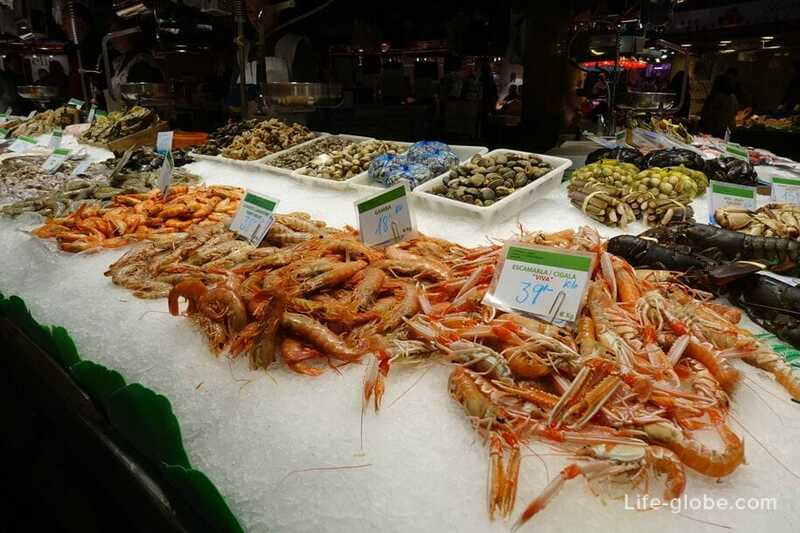 Prices fluctuate depending on seasons. 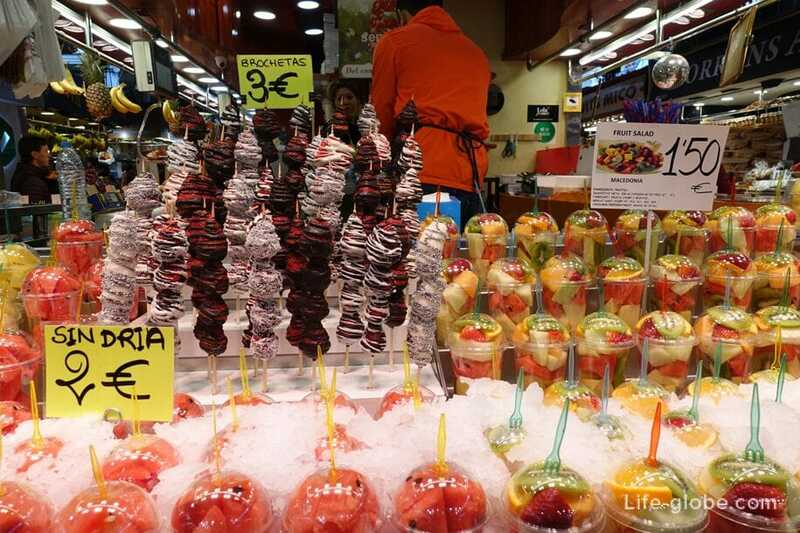 So, our small advice: do not buy immediately, walk, look, if you want bargain... and only then make purchases. 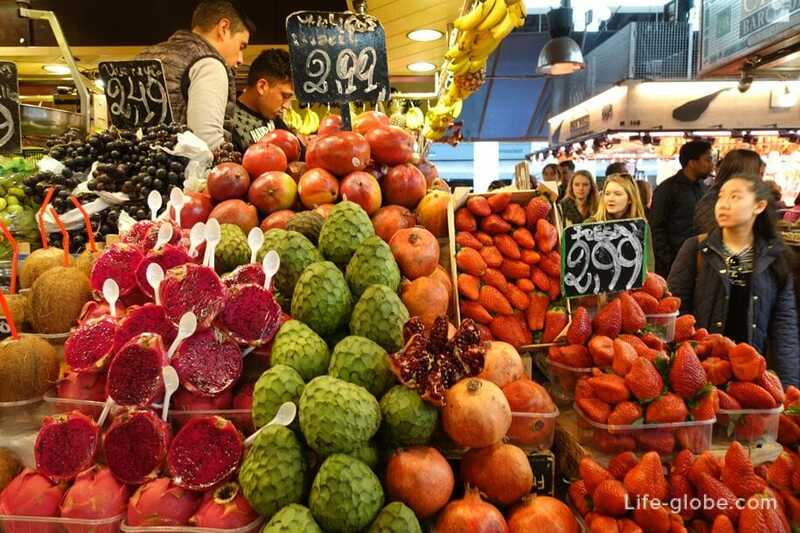 Fruits and berries - is, like seafood, is a separate issue. 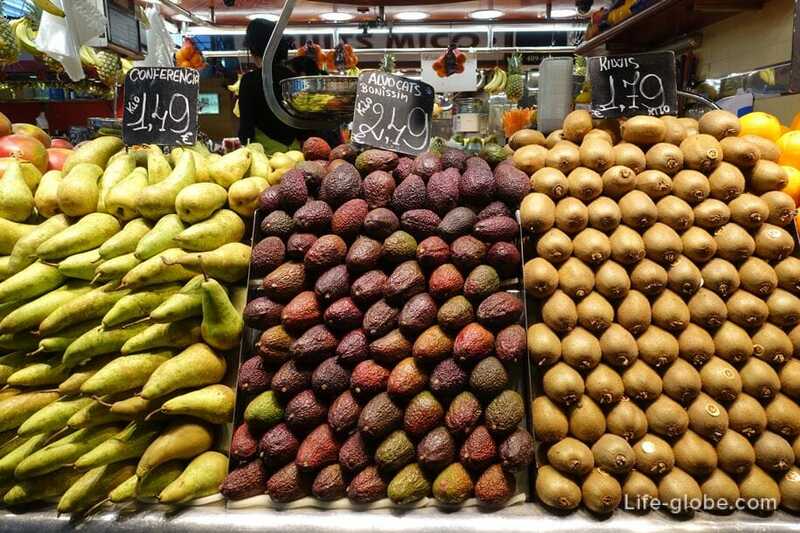 There seems to have all the fruits that you can try, both at home and in most European countries, and those that grow in the southern countries (Asia, Caribbean, etc. 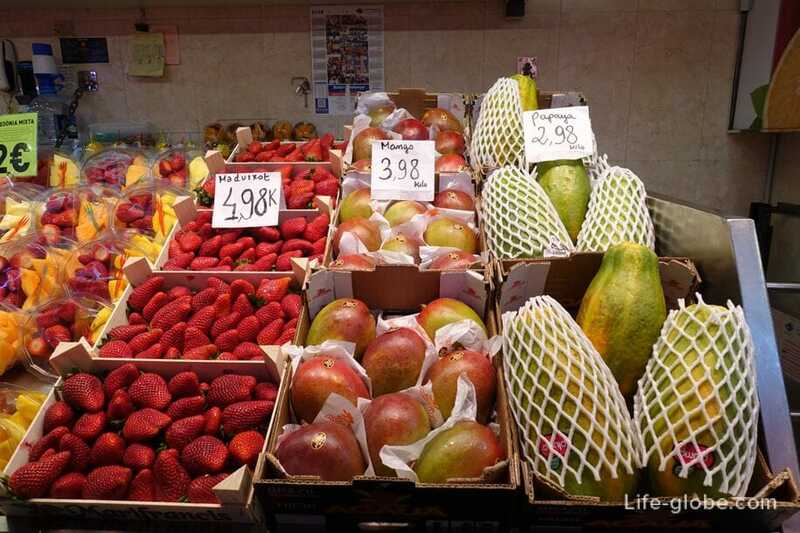 ): passionfruit, at a price of 14.95 Euros per kg, mangosteen, pineapple, mango, papaya, coconuts, dragon fruit, noina, rambutan, etc. 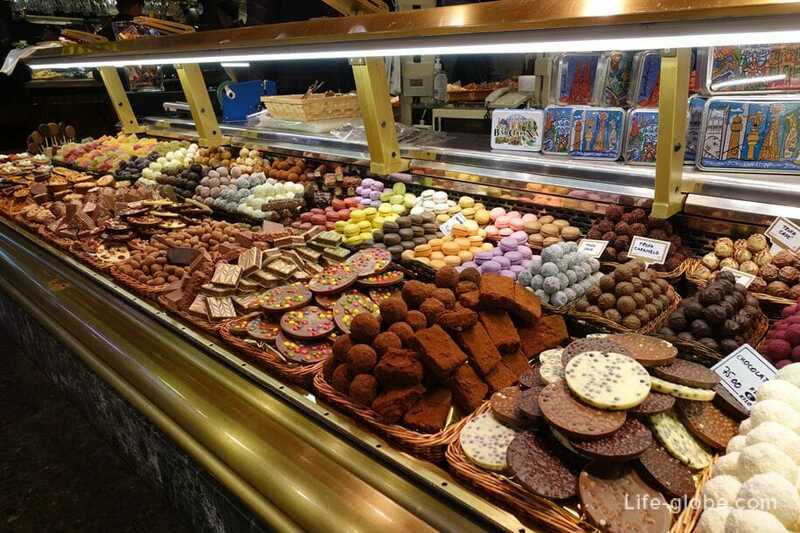 Naturally, the price on all these Goodies are too high, and it seems several times. 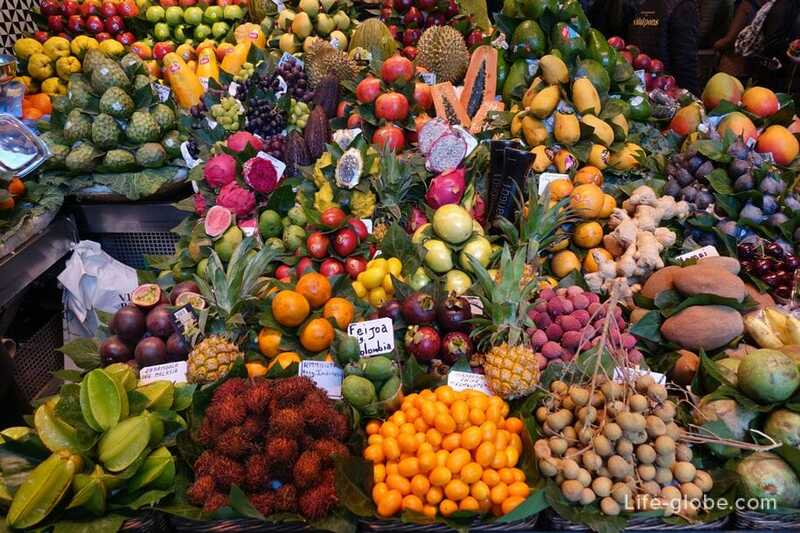 If the taste... pineapples are so-so, more of the smell and colour, still with some greenish colour taking them; passion fruit is not only delicious, but also very useful fruit, though it is worth it in this market more expensive than even in Italy, but this easy, so if you take a few of these later on, felt the pocket is empty. 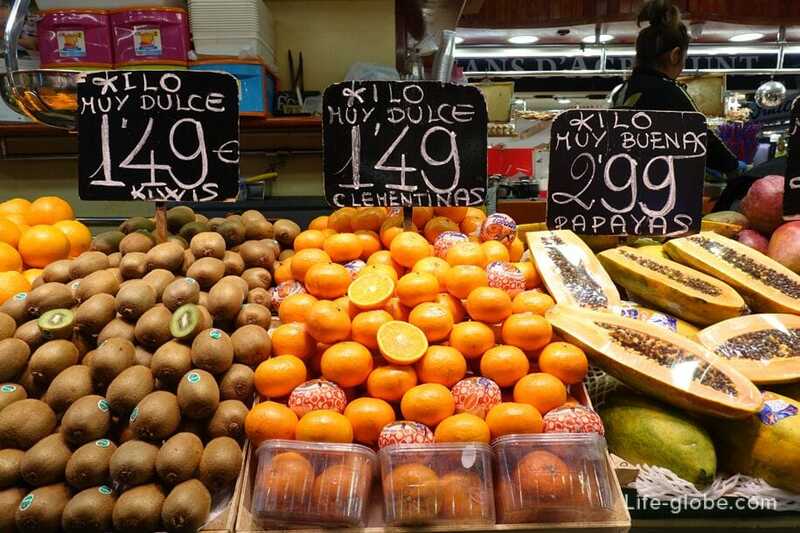 Also, very tasty Spanish and Sicilian red oranges, tangerines. 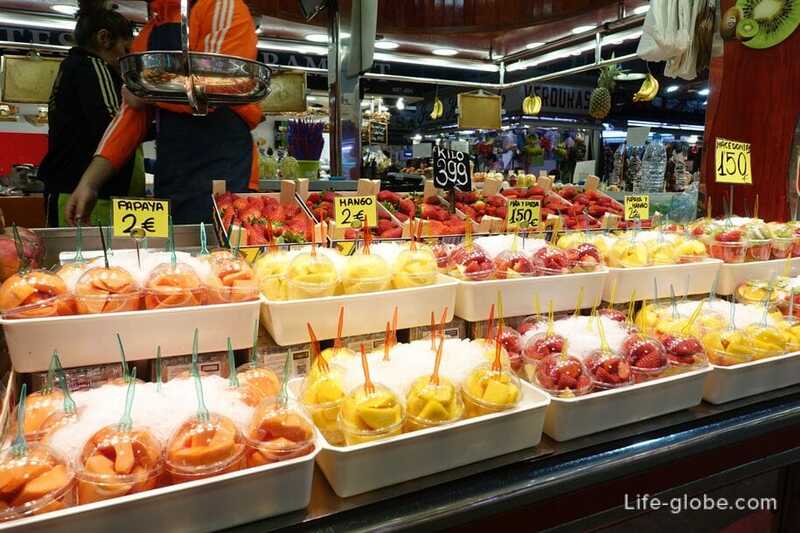 Fruits and berries can be bought not only in weight, they also sell pre-cut mixes in cups, which is very convenient, over time you can try an assorted variety of fruits. 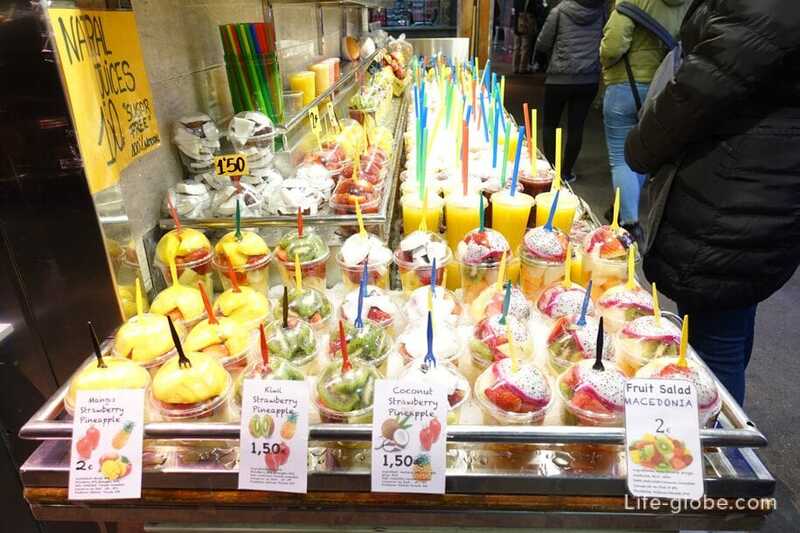 There are fresh juices that are already prepared in disposable plastic cups. 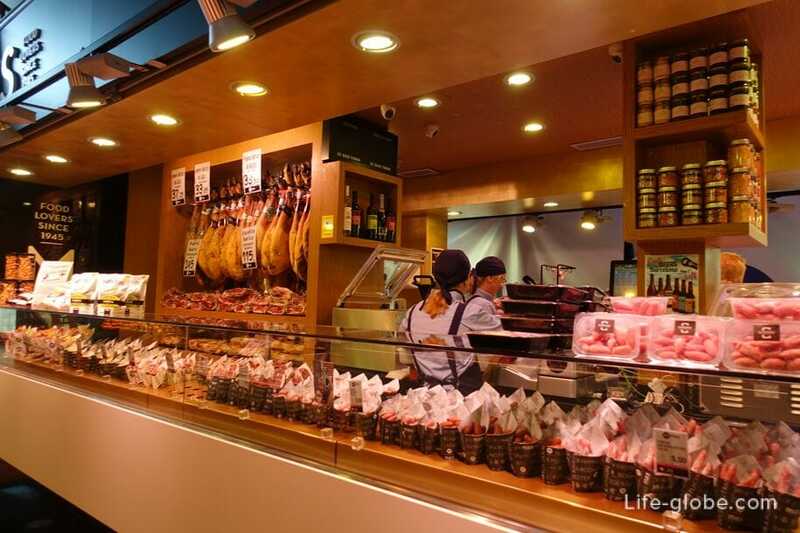 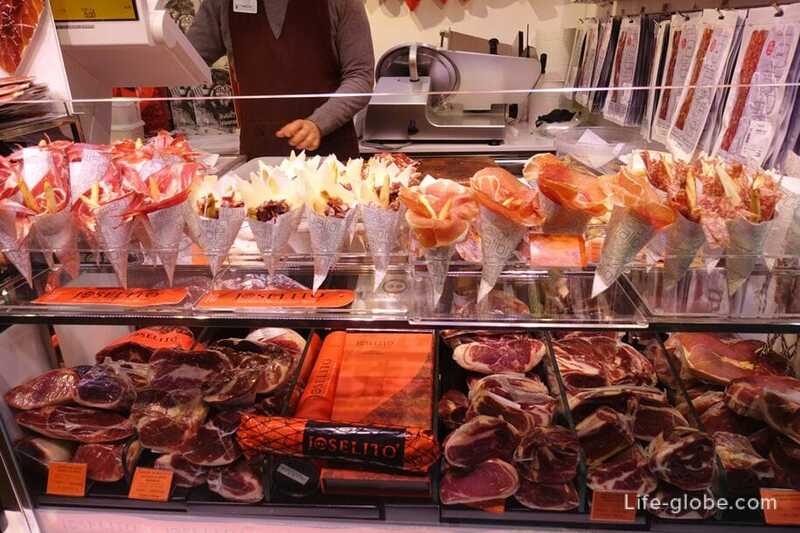 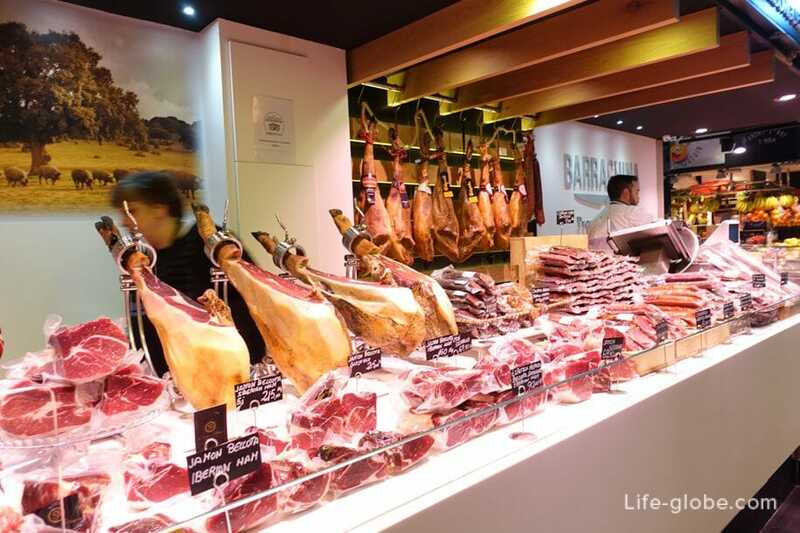 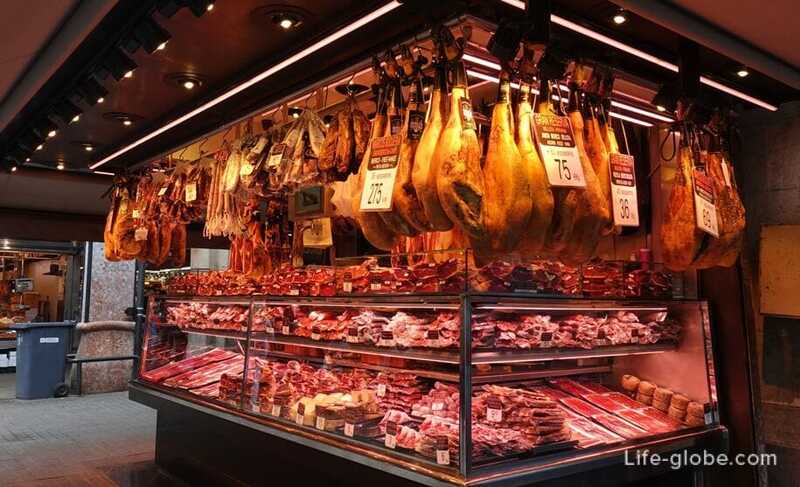 Large selection of jamon and cured meats, sausages, cheeses, olives, wine. 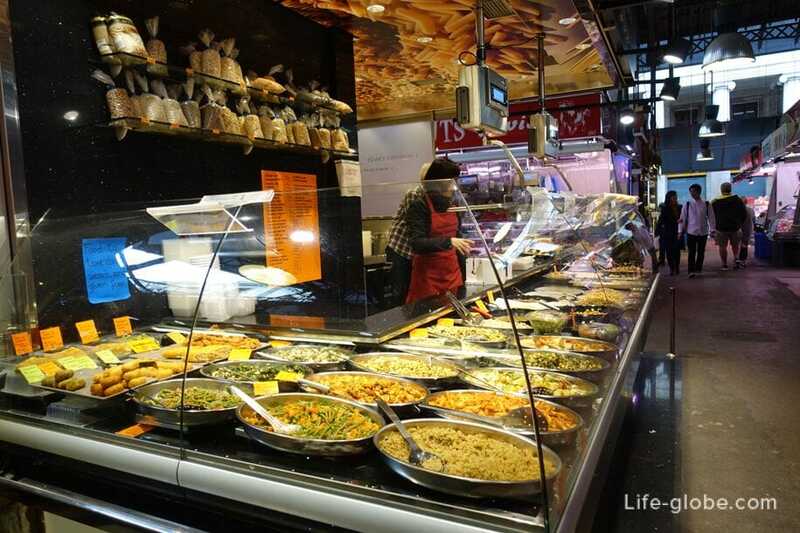 As well as: vegetables, raw meat, eggs, chocolate, nuts, dried fruits, freshly baked breads, sweets, etc. 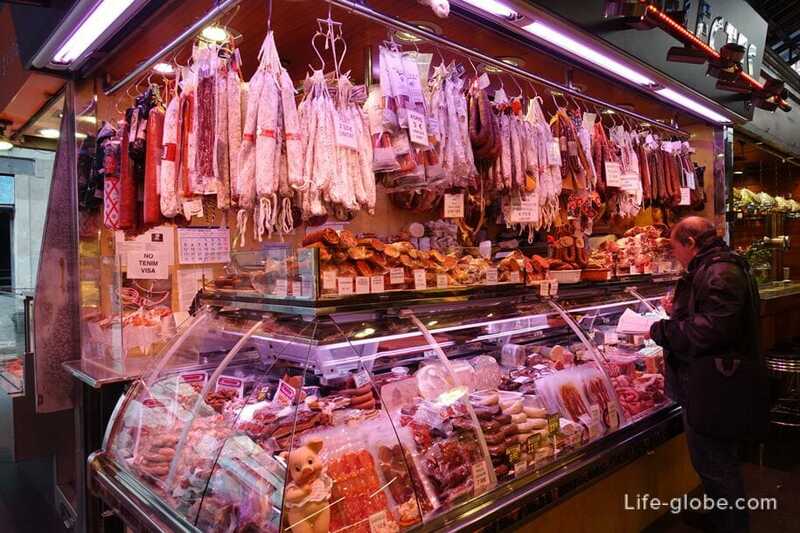 This is a separate issues and the weakness of many tourists! 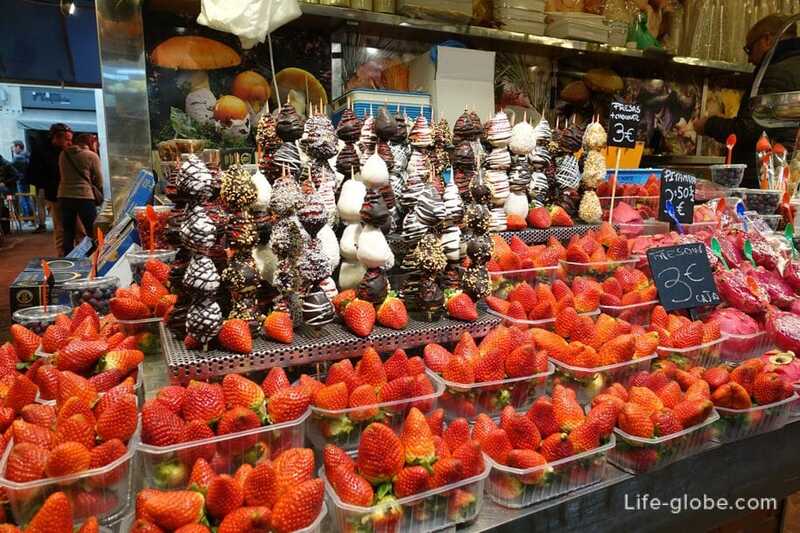 The Boqueria market, you can have a snack and a full meal. 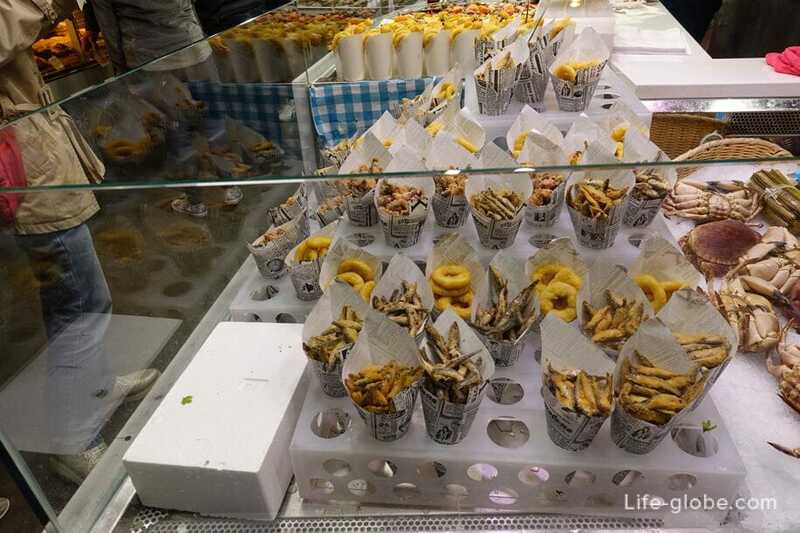 There are patches where you can select already prepared fried seafood. 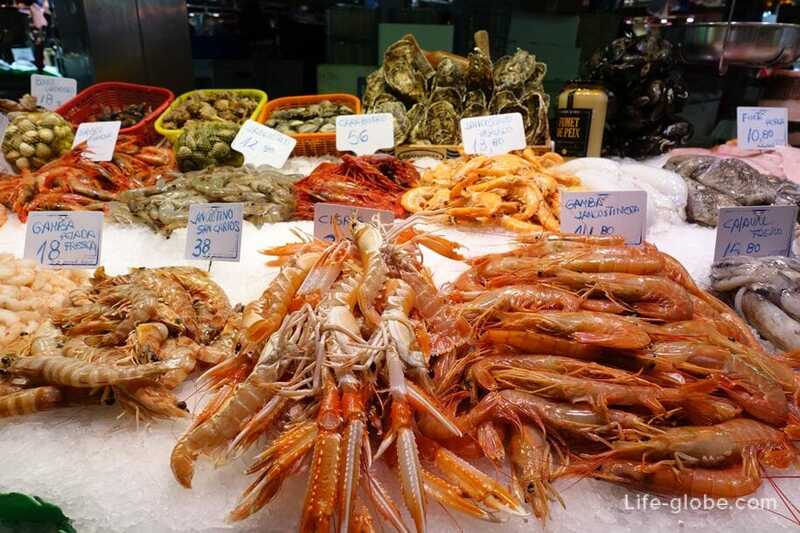 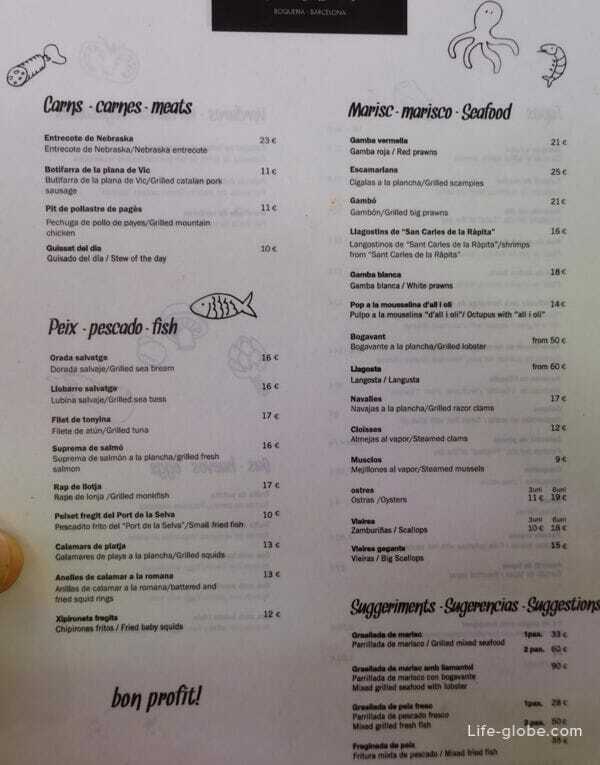 And there are those that are suitable, choose the seafood and you'll cook them. 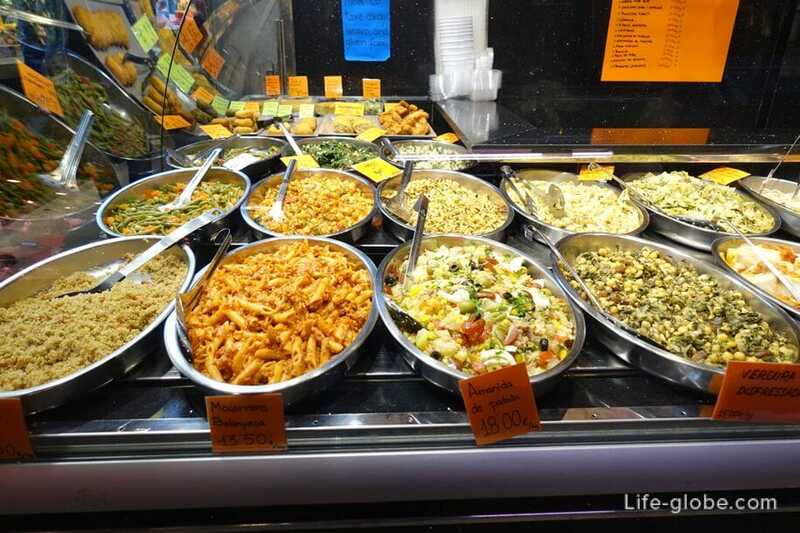 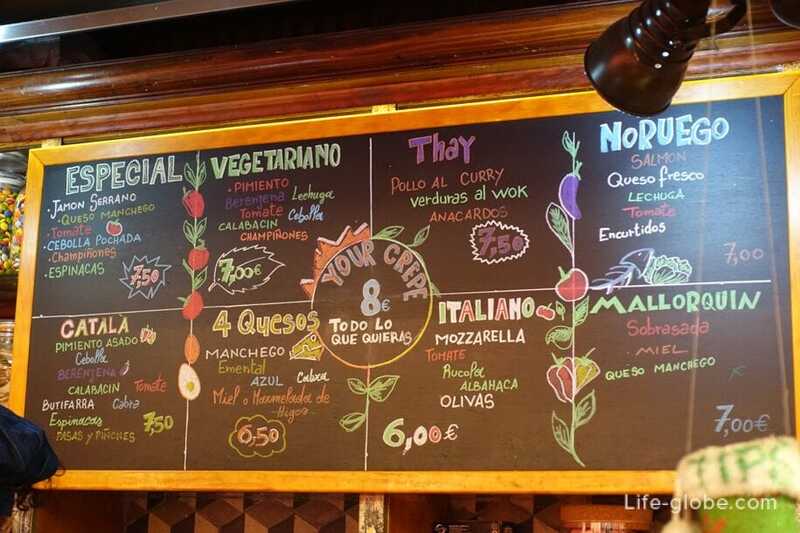 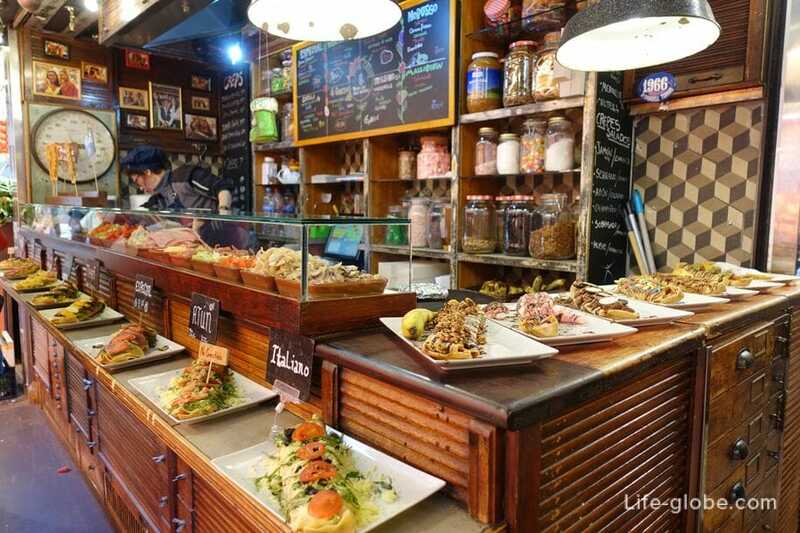 And hit the market several cafe bars where you can enjoy a variety of dishes, ranging from vegetables and the most simple of tapas, to cheese and dishes with seafood. 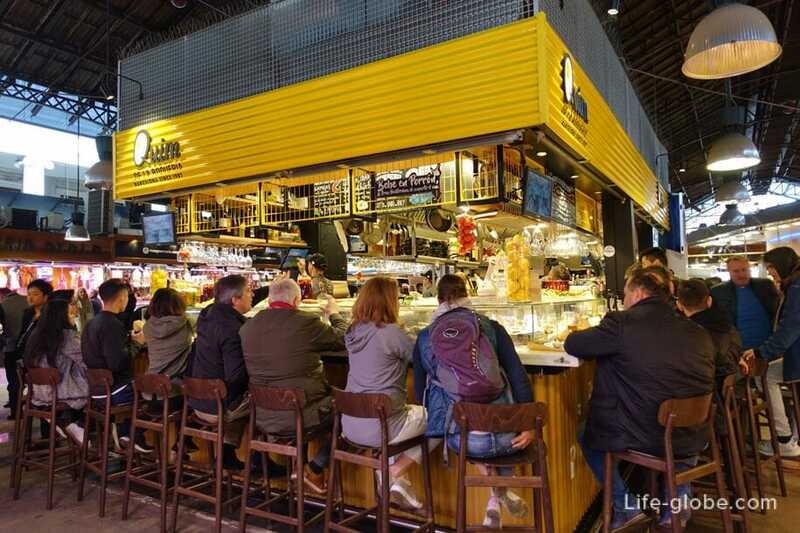 In these cafes you can drink. 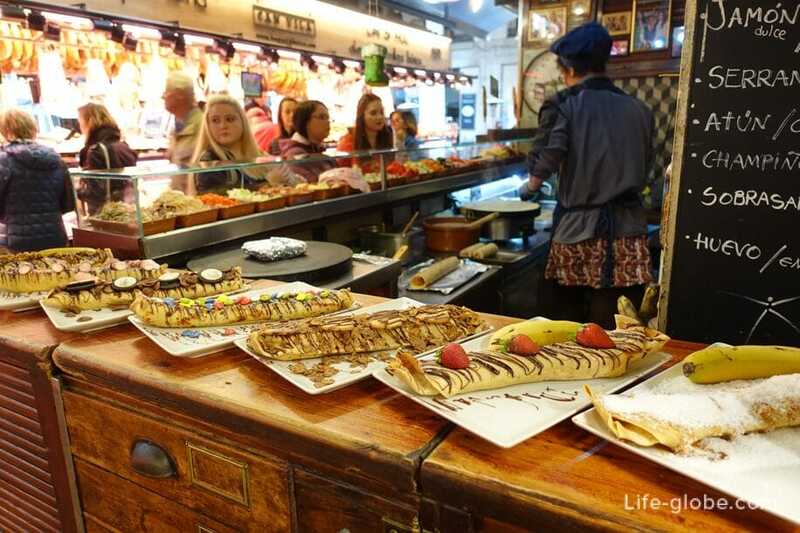 Drinks: from wine, beer or something stronger, ending water, mineral water, coffee or tea. 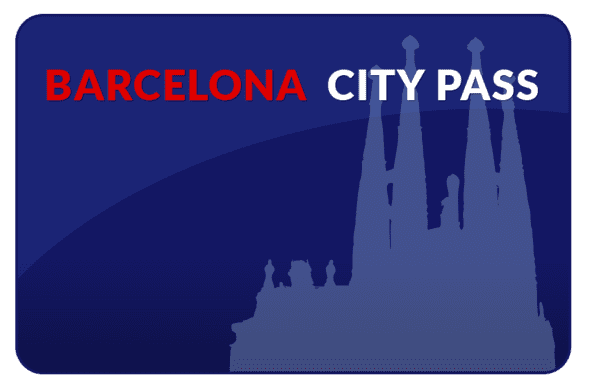 Monday-Saturday: 8:00 to 20:30 hours. 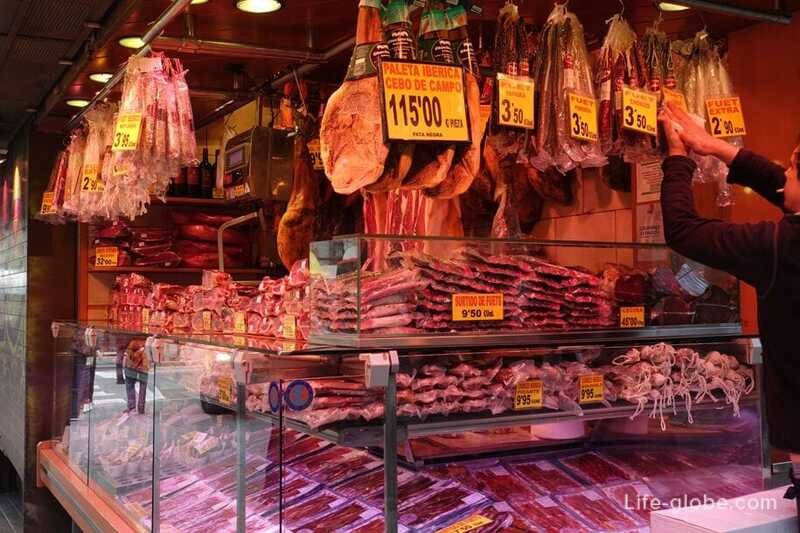 In festive and holidays the opening hours of the Boqueria market can change, please check before visiting. 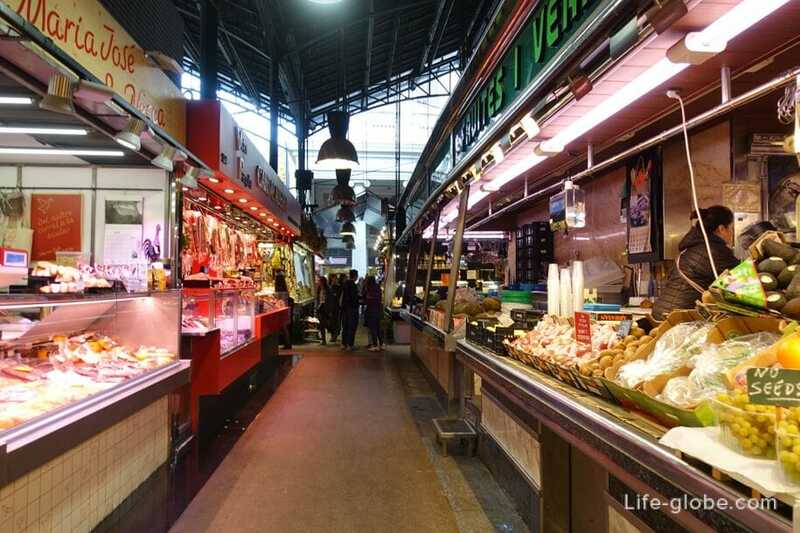 As you can see, the market is clean and well maintained. 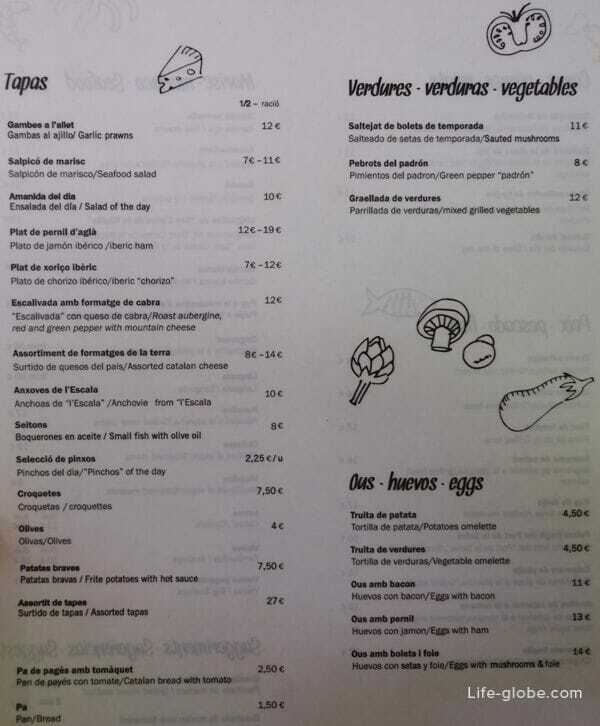 The choice of food is very high. 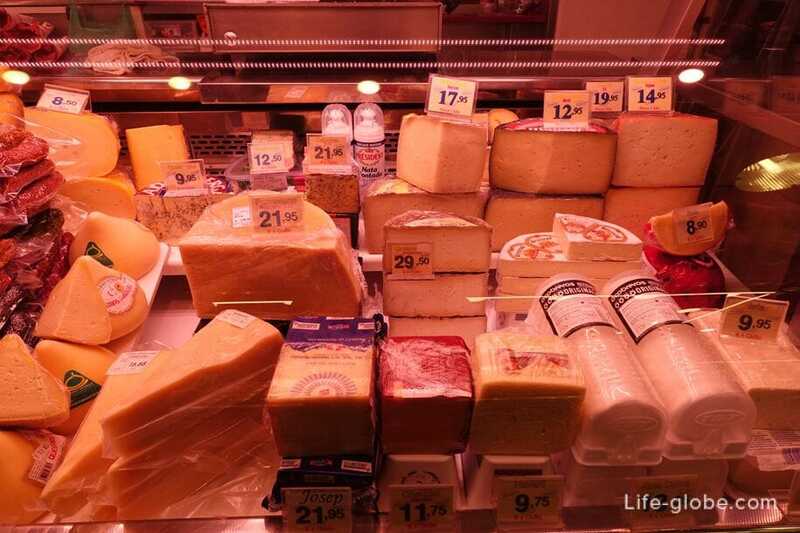 The shelves are decorated artfully - well, all to attract the tourist. 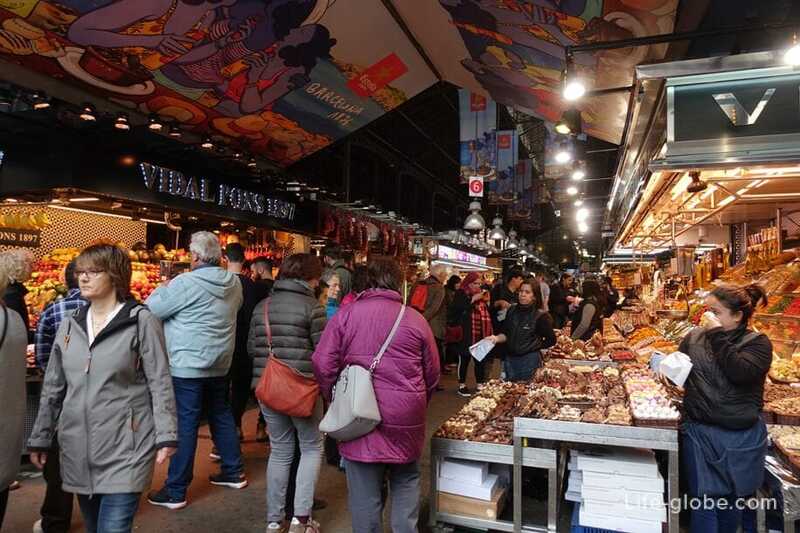 If you are not going to buy anything in this market, you come once, just to look, I think it's worth it, especially that far to walk not necessary, is very convenient for tourists. 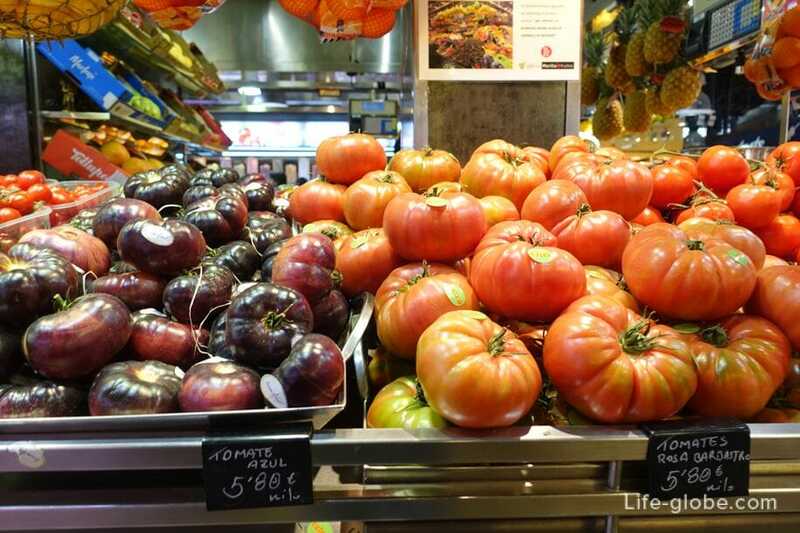 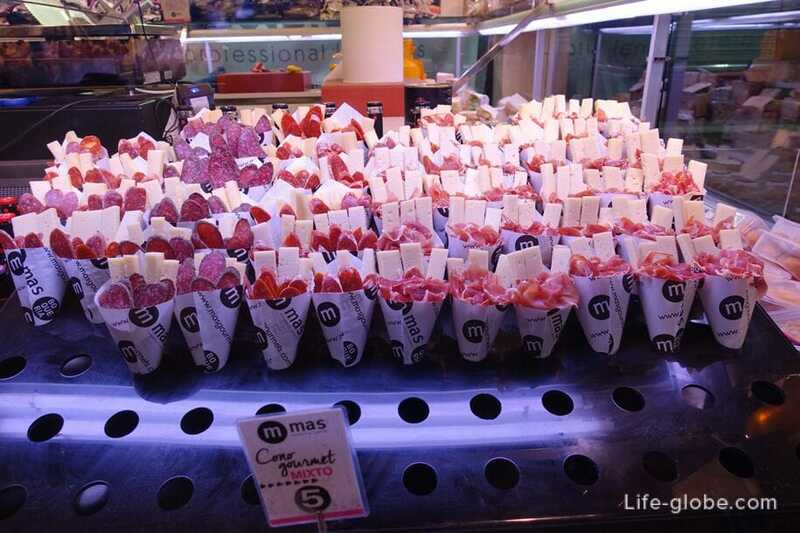 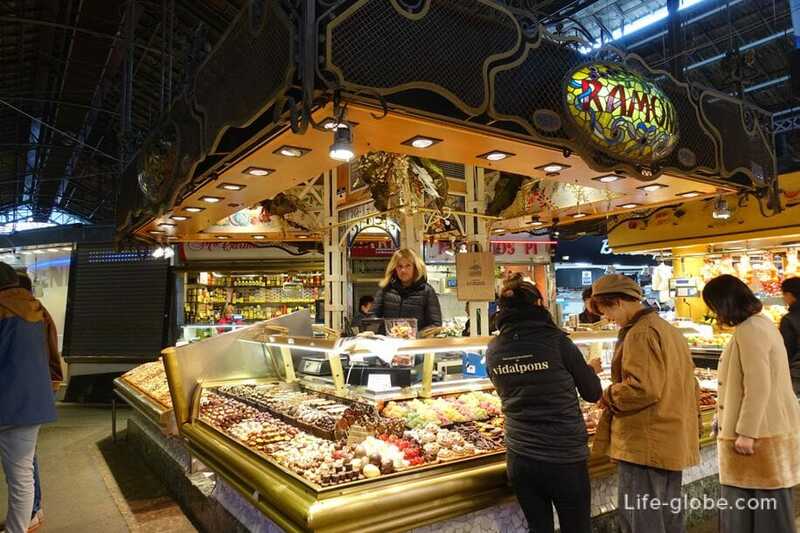 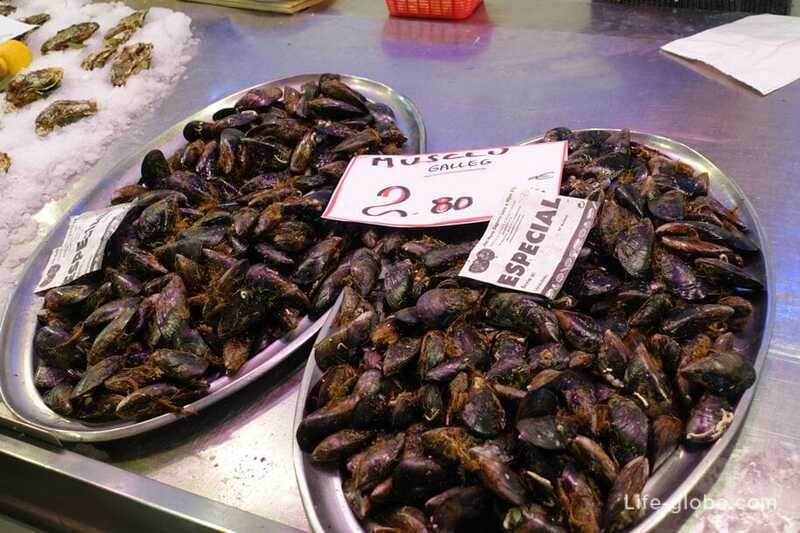 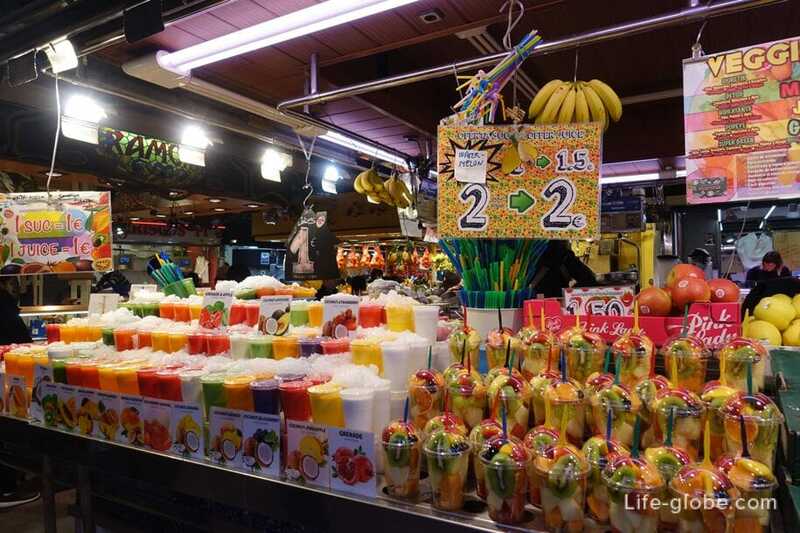 A trip to the Boqueria market can be combined with a walk along the Rambla. 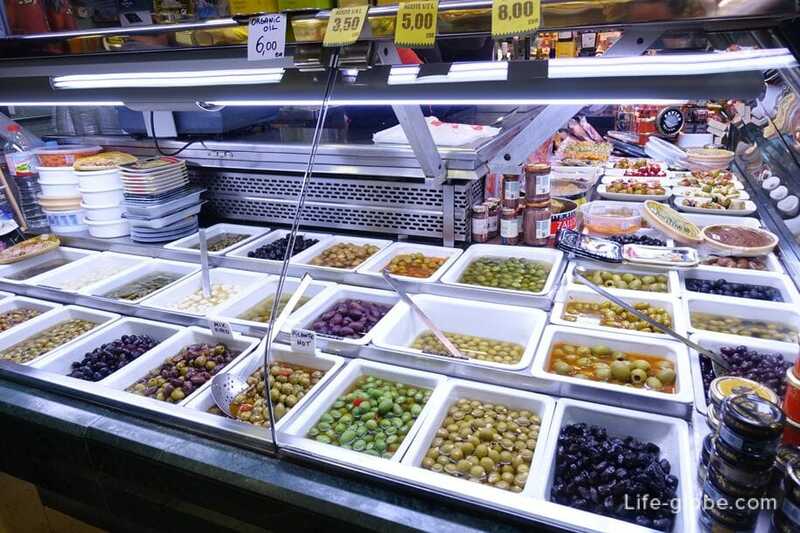 On the right side of the market there are several open rows. 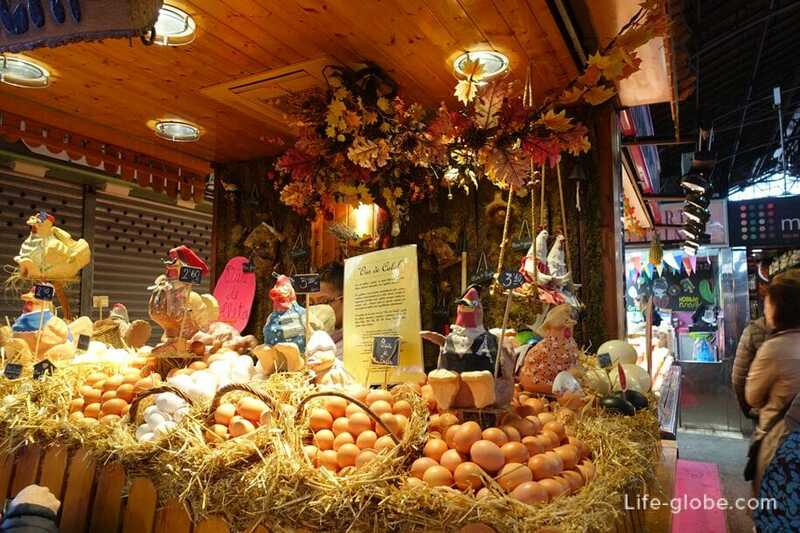 It was there that sells local seasonal produce, as the saying goes: "What has grown in particular period of the year". 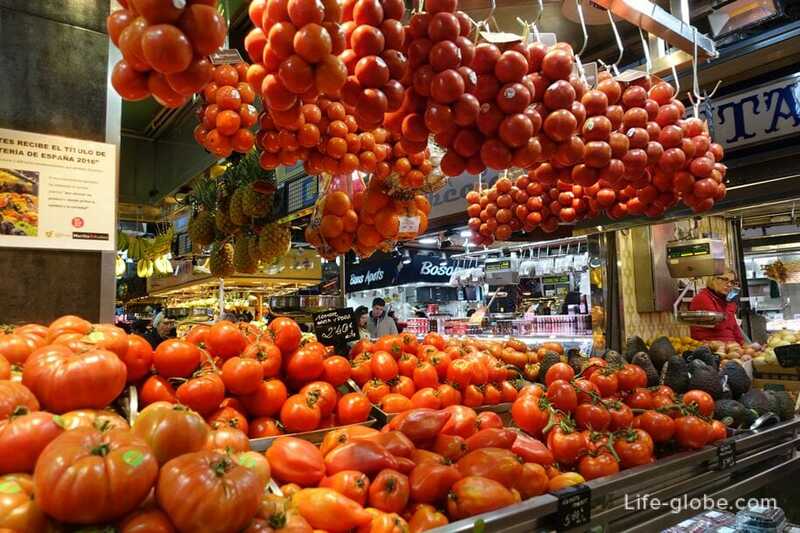 In these series you will not see beauty and grace, as well as something unusual. 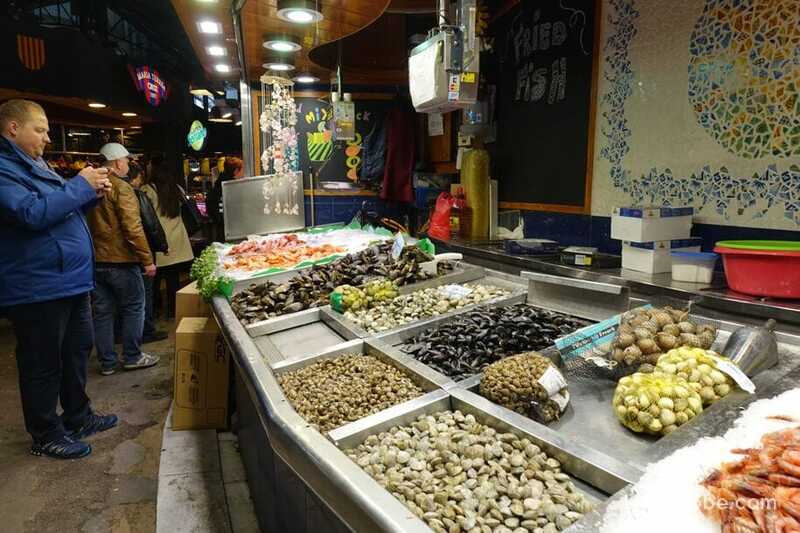 Here you can often meet the local people, something buying, people.